H.G. 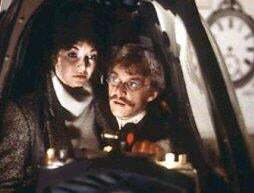 Wells (Malcolm McDowell) pursues Jack the Ripper (David Warner) across time in the 1979 film Time After Time, set in a Morlock-free San Francisco. In this cult favorite, Wells invents a time machine in 1893, zooms into the "present" and meets a woman in what he considers a dystopian future (imagine thinking the future would be all gleaming steel and floating airships and ending up in Haight-Ashbury in 1979). Then he zaps Jack the Ripper, and heads back to his own time (lady in hand) to live happily ever after. It might not sound like something you'd ever see adapted into a musical, but brace yourselves for its Broadway debut sometime later this year if things go as planned. Playwright and musical lyricist Stephen Cole wanted to stage a musical version of The Time Machine at one point, but "Eventually I realized a musical with Morlocks would be a surefire flop and became more enamored with Meyer's film. Then I got the rights." So he thought this would be the next best thing. They've updated the time-period to 2009, and they swapped San Francisco for New York in order to give wells a bigger shock. We're not sure how audiences will embrace an H.G. Wells who sings and dances but if you haven't seen the original film, be sure to check it out. It's written by Star Trek writer and director Nicholas Meyer, and where else are you going to see someone unveil a time machine at a dinner party?